Over the last month, Chris Rock obviously has had issues with being pulled over by the police. So much so, he chronicled every instance of his traffic stops with selfies. Most black people in America realize that there is an issue with racial profiling when it comes to driving while black. Racial profiling has sparked successful lawsuits in states like New Jersey and continues to plague black people in other areas. So what should Rock do to prevent himself from being pulled over? 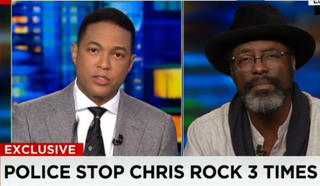 Fellow actor Isaiah Washington shared his views on social media, which found their way to CNN and Don Lemon. Washington started out by giving asinine advice to Rock on Twitter. So in Washington’s world, in order for Rock to stop getting pulled over, he should get a less flashy vehicle—not that cops should stop racially profiling black people. During his CNN segment with Lemon, Washington continued his diatribe about how black people should adapt to being racially profiled. “There is something that is happening in his neighborhood—they [police] are looking for something. Obviously, they are not looking for Chis Rock,” Washington said. “What I was doing was trying to excite a conversation. We are looking at this term ‘driving while black,’ but maybe we should be looking at the term ‘black’ itself and have a different conversation,” he added. Not once during the conversation with Lemon did Washington mention looking at the way police do their job. But he did state that maybe Rock should visit his local precinct and ask why he’s being pulled over so much—right after he buys two Priuses, of course. “He needs to look at the area he is in and visit with the local police officers in that community … and question them as to why they are pulling him over specifically,” Washington said. “But that is putting a burden on him,” Lemon responded. You know, it’s not often that Lemon makes more sense than his guest. Kudos to Washington for giving Lemon a “likable” moment. I even had to inquire myself about Washington’s rationale. As a person who vacationed in Southern California a couple of years ago, I picked a Prius as a rental car. I was offered a flashier car, but I turned it down. Guess what happened? I was pulled over. Washington’s theory about adapting is flawed. I’m going to need him to put the onus where it belongs, and not in the hands of black people.